In 1978 Luke and Dorothy Beidler moved to Kalimantan, Indonesia — where the Dayak people live along wide rivers in a great tropical forest — as pioneer missionaries with Eastern Mennonite Missions. In a groundbreaking partnership between an Anabaptist mission agency in the global South and two from the West, the Mennonite Mission Board of Indonesia (PIPKA), EMM and Mennonite Central Committee united to send the Beidlers and others from Indonesia and the U.S.
Paul and Esther Bucher were appointed by MCC in 1979 from the U.S. From PIPKA came Pak Darmono in 1977, followed by John Reiner Paulus in 1978 and Gusti Ngurah Filemon in 1980. EMM already had a long history of sending workers to places where the church did not yet exist, and PIPKA was fired with the same vision. Together they went to West Kalimantan, a region of Indonesia to which Islam had come 300 years before but where a high percentage of its people still followed their traditional religion. MCC contributed skills in community development as well as in verbal Christian testimony. The Beidlers found in Kalimantan a people who knew of, but did not worship, God. The Beidlers learned the Dayak language and began to share the Good News. Traveling by boat and sometimes living on the water in a bandung (house boat), they began initiating fellowships of new believers. Now 35 years later there are 19 PIPKA congregations scattered along the region’s rivers. A team from the International Missions Association, a group of Anabaptist mission bodies, visited the region in March. It consisted of Yesaya Abdi, chair of PIPKA and president of IMA; Dri Soesanto, regional director for PIPKA; Tilahun Beyene, coordinator of IMA, and Richard Sho­walter; IMA coach and president emeritus. Since EMM and MCC disengaged from ministry in the region years ago, little has been reported in the West. However, the seed sown then and now by PIPKA is far from dormant. Everywhere the team went, people remembered the Beidlers, now members of Methacton congregation. “They spoke our Dayak language, and they spoke it well,” said Pastor Hendrikus Kipa of Melapi. The Beidlers’ and Buchers’ willingness to live among the Dayak villagers in primitive conditions is long remembered. “Go back home to the United States and say thank you to the people who sent Luke and Doro­thy,” said Petrus Kipa, a young pastor and the son of Hendrikus. Today many churches comprise half a village’s population. At worship gatherings, the benches are filled with children, fathers, mothers, grandpas and grandmas. Village chiefs are staunch members of the congregations. In the village of Uchung Bayur, Pastor Yusak Sudarmanto led the people in preparing an elaborate ceremony of welcome to the team of visitors from Jakarta, Ethiopia and the U.S. Dancers led a procession to the meetinghouse, festooned with palms, lights and ribbons. Seventy-five children formed a great choir. The congregation Sudarmanto leads dominates the spiritual life of the village, but this brings challenges as well as rewards. Abdi, Soesanto, Beyene and Showalter offered encouragement and prayer, noting that tough political questions can torture church leaders in Kalimantan forests as well as in Jakarta and Lancaster, Pa. The visiting team did more than observe. They preached, sharing reports of growth and opposition in the global church, with a special focus on Ethiopia and the Middle East. The villagers turned out in force even at inconvenient hours. After visiting the PIPKA congregations, the team made its way to the isolated mountainous region of Silat Hulu, where PIPKA had been invited for a conference of pastors and revival meetings among churches planted by Worldwide Evangelization for Christ missionaries. Abdi used peanuts to illustrate financial giving. Beyene told stories of the Ethiopian underground church to people who had never heard of Ethiopia. 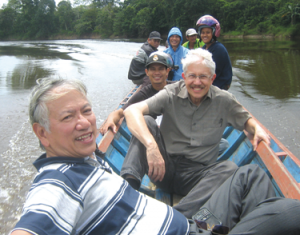 Dri Soesanto, the PIPKA regional administrator, frequents the Putussibau region, helping maintain contact with the national and global Anabaptist community.